A Blend of Performance and Comfort in an All-Season Ultra High Performance Tire. You can have it all with this fuel-saving tire. Low road noise, smooth ride, wet road hydroplaning resistance and dry road handling. Optimized tread pitch width and alignment reduces road noise levels at higher speeds. Lateral and longitudinal grooves deliver more control. Additional sipes and grooves improve hydroplaning resistance. 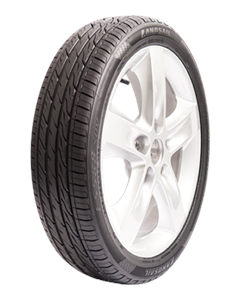 A larger tire contact area allows grip, stability and control.